For memorial weekend my husband had off work, so we decided to do some kind of day trip with the girls. We decided to go up to Johnson City in Texas, which is just about an hour North of us. We've heard about how they have great Christmas lights but have never made it there yet. So, with a few clouds in the sky we commenced our trip. 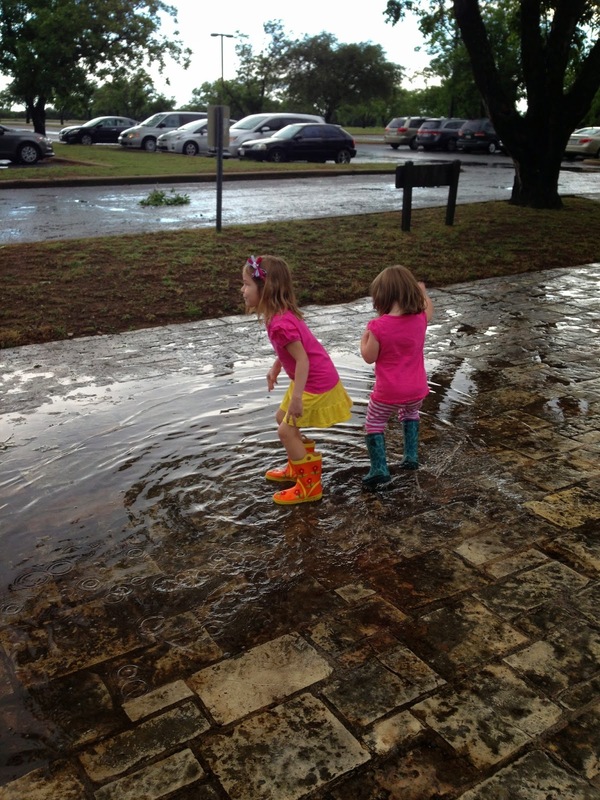 What we didn't expect was a torrential downpour!! Yikes! We almost pulled over a few times because it was so bad, but my oldest daughter had to use the restroom...so we just drove pretty slow through it all in search of the next bathroom. We finally made it into town, however and made our first stop at the Lyndon B. Johnson Visitor Center (I believe that's what it's called. It kind of gets confusing because there's actually two separate parks for LBJ). Inside, there was a park ranger and we were able to ask what we could do still considering we've never been and with the weather being like it was. She gladly assisted us and gave us a map with lots of options. Inside the building was also a small museum display on the life of Lydon B. Johnson. It was done very nicely and we were able to walk around for a bit with the girls. They listened on the handhelds to some of his talks and speeches, which was fun for them to go around picking them up. Not really any hands on stuff for kids, but since it was our first stop in an hour the girls had lost of fun anyways. The gift shop was fun to look at too. From there we drove just to the next corner over and were able to go into the boyhood home of LBJ. He wasn't born there but it was where he grew up during most of his childhood. The house was all set up nicely, like the time period it was from. The girls enjoyed looking at each of the rooms. There was a ranger there giving brief talks about the house. She was actually leaving for lunch but she let us just walk through for a moment before she locked it up. So be sure to check times for that. Parental note: there was a weird picture in the parlor that looked like a scull that was hanging up on the mantel. I'm very careful about what my little girls see (don't want nightmares), so I kind of distracted them and then quickly led them back to the kitchen. My husband inquired about it and was told it was actually a painting that LBJ's mom used as a teaching lesson because it looks like a scull but if you looked at it carefully it actually looked like a lady looking in a mirror. So, her lesson was to her kids that 'things aren't always as they first appear'. 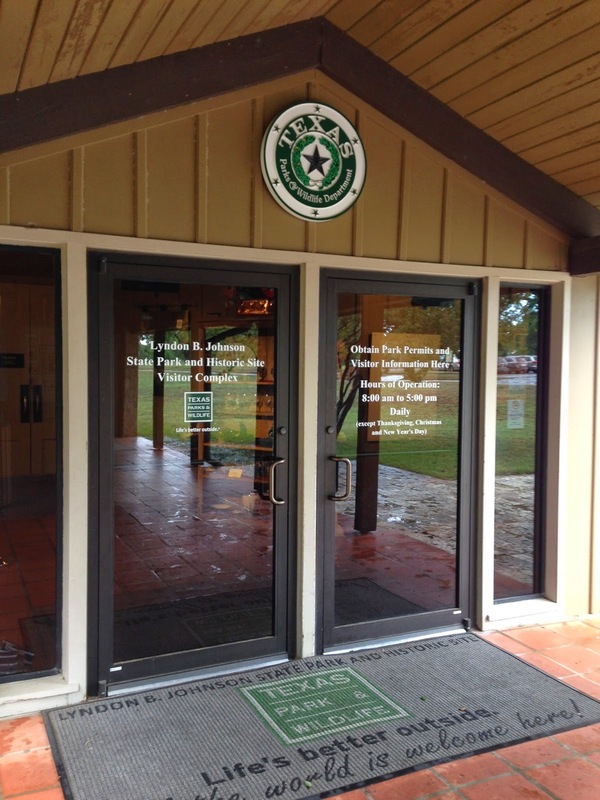 We wish we could have stayed and done the walking trail that went to a couple more places near the visitor's center but with the weather still raining on us we decided to drive the 13 miles further down that road to the actually LBJ National Park, which was his family's ranch. When you get there you have to check in at the building to get a free permit that lets you drive through the rest of the park. This is the building where you get your permit. It's free. They just want to keep track of how many visitors are coming through. We took a quick break in the car while it rained a bit more and ate lunch in the back of the van. When we got our permit we were gonna head out but noticed some more buildings in the back of the permit station and so we took a quick peek. And I'm so glad we did! There was a fun museum back there on the German immigrants that came to Texas and how just the different things they ran into moving out to Texas. There were a lot more hands on kids stuff here, so we spent quite a bit of time! My girls got to pretend to churn butter and put together some different meals (Mexican, Texan, German...etc) and they got to get the mail from the post office with letter that the German's were writing home about their new life in Texas. So many great teaching moments here! ...we headed off to the Sauer Beckmann Living History Farm. The rain had stopped just in time! We parked and then walked into the farm (be sure to close the gate so the animals don't sneak out). 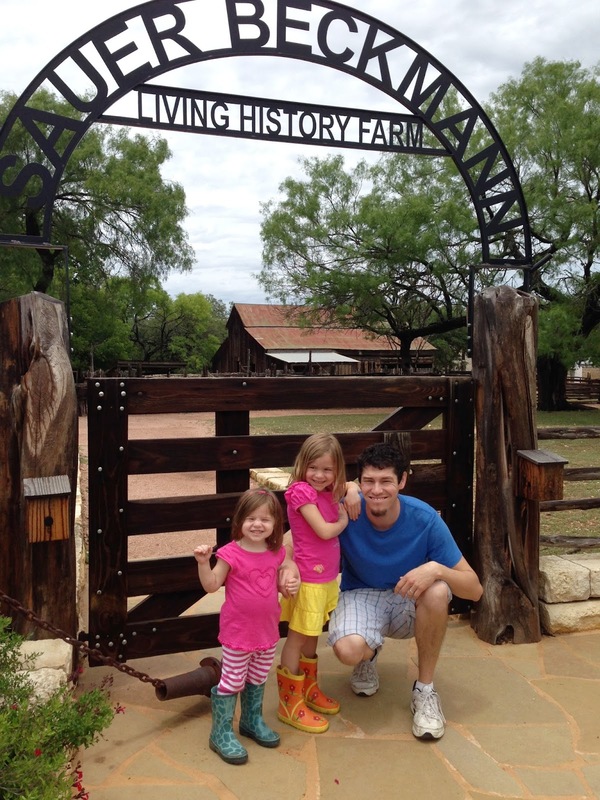 This farm was actually a neighboring farm to LBJ's family and is still up and running. They call it a living farm because they have people hired who come and actually live on the farm and operate it as if it were 1912, which would have been the time period of LBJ growing up. It is so neat out there. You can just explore all the buildings (be sure to watch your little ones in the barn because it is a working farm and lots of tools are out). We saw hogs, turkeys, chickens, cows, and a bull. We also saw that they have a garden, which is where they grow their food. So, during the day there will be people there operating the farm as if it's theirs. We ran into this gentlemen there and he was so kind to show us around. He explained that they eat, and work on the farm from 9:00am-4:30pm but then get to go home and live like you or I. So, when they're there they are making soap, canning, milking the cow, tending the garden, feeding the animals, and storing their food, doing laundry, mending clothes, and he said they even do butcherings on occasion. And they do it all using only equipment that would have been available back in 1912. 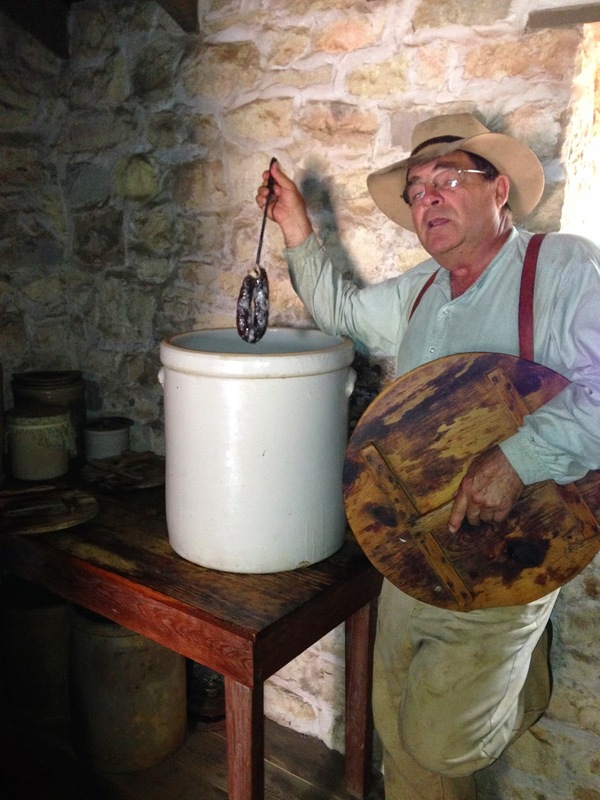 It's amazing to see how they preserve their food in big tubs of lard -for up to 16 months!! He also taught us about what they do with the milk and how they can make butter with the cream or let it set and make clabored milk (yogurt) or they can let it sour and then strain and make it into cottage cheese. Above is their cream separator machine they used in the early 1900's to separate the creme from the top of the milk. He demonstrated how you'd put it in and then crank the handle and it would pretty much work like a centrifuge and spin and the cream rises up to the top and comes out one spot and the regular milk comes out the bottom spout. So cool! Didn't realize they used tools like this back then. 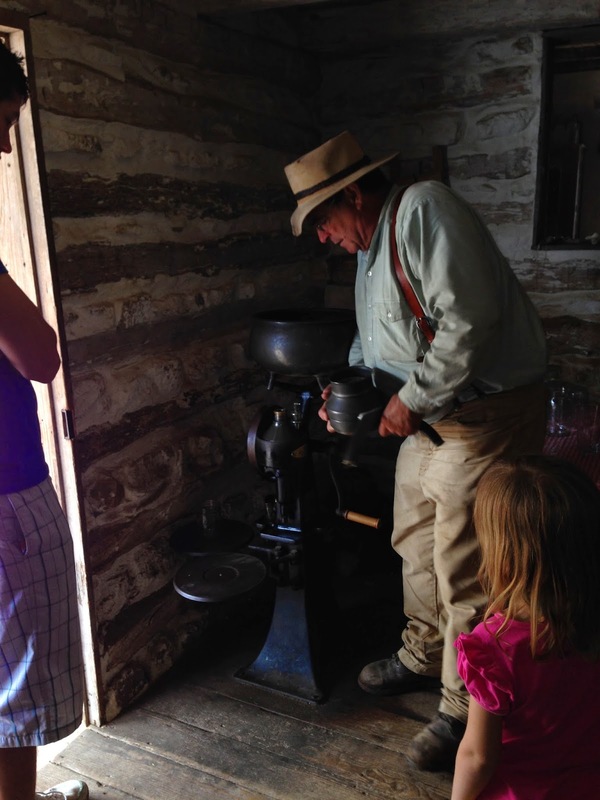 They also have a hand grain mill for making corn meal. 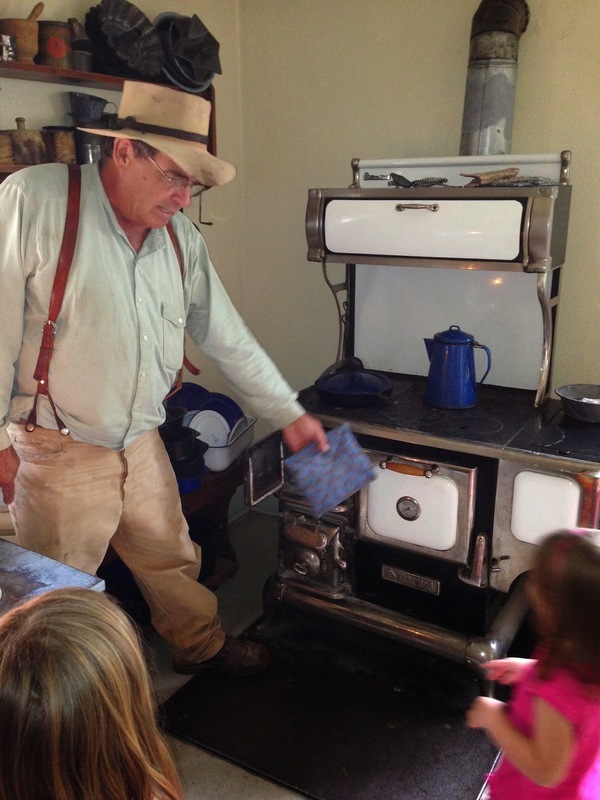 He showed us their wood burning stove and the leftover from their breakfast on there. Ha! It was so neat!! You can walk into any building and just explore! If you're planning to go, something to keep in mind is that they don't do demonstrations. So, it's not like they have soap making class at 3pm. He said that they just do what they need to do when they have time to do it...like a real working farm would. He did recommend however, that they usually do the milking early in the morning when they first get there. So, be sure to get there early if you want to see that. If you drive just past the farm there are a bunch of picnic tables and some swing sets for packing a lunch! (Wish we would have known that, then we could have skipped our picnic in the car.) The bathrooms are also there and were kept very clean when we went, which is always a plus! After the farm we went off to do the driving tour of the LBJ ranch. Yes, ANOTHER different part of the LBJ park.When you drive through there are a handful of numbered spots on the tour that you are able to get out of your vehicle and go into the building or walk around the area depending on the stop. The first stop was the school of LBJ. It is an old one room school building that he attended when he was 4 years old. They also have an audio recording which explains a little bit about the Presidents history with this building. Nothing hands on, so a quick stop for us and our girls. We skipped a couple stops because of time and our girls but there are a few stops besides the schoolhouse where you can get out and look around, like the family cemetery where the President and the First Lady are buried. We kept driving on the ranch to go to the next stop. What I found really cool was that cattle were just grazing on the grass all around you. So, watch when you're driving. The ranch is still completely operational. And as we kept driving along the road there were some signs that would give us some more information about the president and his family and more cattle...and more signs...and more cattle! The girls enjoyed the drive. There was a stall area that you could get out at and they told us that sometimes they'll have a big bull down there so people can see them up close...but as we drove by we didn't see any animals in the stall so we stayed in the car and continued on to the Texas White House. When you complete the long loop that goes around the ranch property and around the airstrip mainly, you will come to what they call the Texas White House. No, it's not a replica of the white house, but it is the ranch home of LBJ when he was president. He spent some 500+ days at this house when he was president and so it earned the nickname of the Texas White House. You can choose to pay a $3 fee for each adult (18 and over) for a tour of the house but there was plenty for us to do free and we could tell the girls were running a bit on empty and didn't want to push it. Instead, we walked over and saw the air force one plane that few him from the Lackland Air Force Base to his home. Then we got to go into the hanger which is not a museum. There was lots of information in there. Not very hands on but we walked through quick enough to keep the girls' attention. We liked his hydrocar, and how it said that LBJ had a great sense of humor and would trick his passengers that the brakes went out as they careened for the water.....just to surprise them when the car kept right on going, floating on the water. My oldest thought that was funny. After the hanger we called it a day. We had so much fun and couldn't believe how much stuff was up in Johnson City that we didn't know about! And there is still so much we didn't do!! Also, if you didn't put it together: Johnson City is actually named not for LBJ himself, but it was named for one of his older relatives. Cool! I just never thought of it! Anyways, I hope you take the chance to drive up to Johnson City and see all the cool museums and stuff at the LBJ National Park and visitors center. Supposedly there are tennis courts and a pool too! We didn't see them but will let you know if we go explore those.